It might be the 3 of December, and I look pretty good on my Christmas goodies to purchase, but I am way behind on my cards, cookies/baking and decorating. I decorate the tree like I imagined I would. I didn't even look to see if I have enough flour and sugar to start baking. I did however pull all my Christmas stamps out and look at them so I could begin the task. I fell in love with the idea of ice skates. In my little world, I someday be able to skate without issue, however I know the hard truth .... its not likely to ever happen. Its my handicap! I do admit it! I used the polkadot and the Northern Flurry embossing folder for the backgrounds. I sprayed some Vanilla Smooch Spritz on the Northern Flurry and skates. I punched the skate blades out with half the Word Window punch, I used part of the Snowflake punch for the connectors on the blade. The Stocking punch in Crumb cake for the bottom of the skate and then the skate itself. I pierced the area where you tie up the laces. Go ahead, play along with the Color Inspiration at Stamping 411, you won't be disappointed! 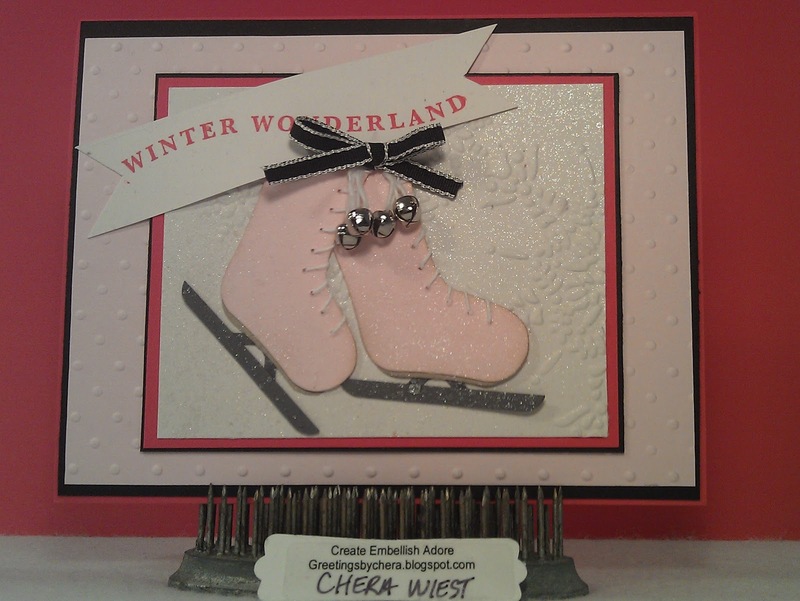 I love that you used the stocking punch to make a pair of skates! Great idea to make real laces too. 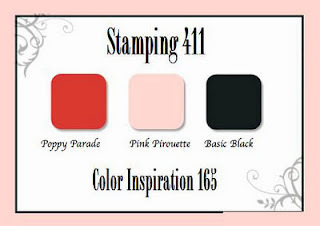 You can't go wrong with a Pink color combo either. 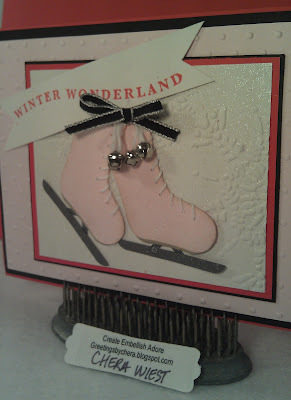 very pretty card, love the embossing and the color combination of this card. I bought some baking supplies today and hope this week to get some done. Sooo Cute!! Thanks for sharing!